Between meeting and association. The public debate about and experiments with candidate selection and voter organization preceding the first direct elections for the Lower House of the Dutch Parliament in 1848. In November 1848, for the first time direct elections took place for the Lower House of the Dutch Parliament. Until then, overt political organization and participation had been frowned upon in the Netherlands, and made nearly impossible by a highly complex electoral system. This article, on the basis of digitized newspapers, for the first time examines the Dutch public debate about and country- wide local experiments with voter organizations in 1848. It argues that the risky openness of the new system persuaded many elite voters to accept voter organizations as a means to prevent possible radical minorities from selecting candidates. While the divided Dutch past and the revolutionary European present were invoked to plea for a ‘calm’ and ‘tranquil’ type of political organization, local political practice displayed more contestation and experimentation than heretofore recognized. Women’s suffrage as a controversial issue among Dutch feminists, 1870-1900. 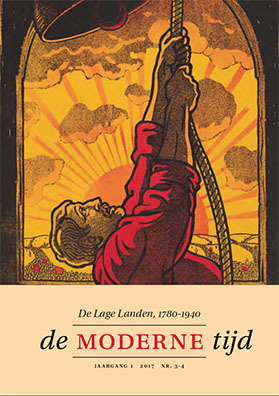 Female suffrage was not the Dutch women’s movement’s central issue from the beginning, nor did contemporary social reformers conceive it as part of the democratisation process they favoured. This article explores the public debate on women’s suffrage against the backdrop of the movement towards universal suffrage in its first three decades. Due to sources refraining from stating the obvious, it remains obscure why exactly parliamentary politics continued to be seen as an exclusively male domain for so long. What is clear, is that conservative feminists associated the demand for women’s suffrage with a radical strand of feminism which they abhorred. What happened to Geertje and what Marijtje thought about it. The use of literature as propaganda by the Vereeniging voor Vrouwenkiesrecht. On October 7th 1908, the board of the Vereeniging voor Vrouwenkiesrecht (VvVK) invited the Dutch writer Johan de Meester (1860-1931) to one of their propaganda meetings where he presented fragments from his novel Geertje (1905). It is a remarkable fact that (non-political) literature was used for political purposes, but not uncommon: the VvVK was known to use literature as propaganda. In this article I will show that the VvVK adopted different strategies for literary propaganda: they used existing authoritative literature, but they also wrote texts themselves. Different types of texts were deployed for this purpose, such as authoritarian fiction with a certain degree of redundancy. Undemocratic elections? Legitimacy, fraud and mistrust in democracy. Even if elections are a contested aspect of democracy, the free and fair elections of political representatives play a pivotal role in the legitimation of political power. Election fraud was, and still is, a main threat to this form of democratic legitimacy. But even in countries with low levels of fraud and corruption, electoral democracy is undermined by a growing mistrust of representative institutions and their capacity to serve the interest of the people.